The incredibly detailed map of the world’s religions above, was created by reddit user scolbert08. To see the full resolution version just click on it. 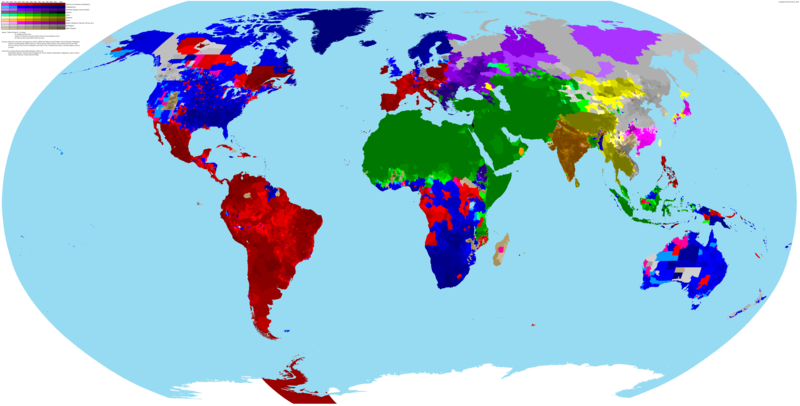 It shows what the biggest religion is by census area in each country, along with its level of support. For example, in large parts of British Columbia the most common answer on the census is no religion, but the intensity of that feeling varies widely. Another important thing to note is that while Christianity is divided between Catholicism, Protestantism and Orthodox denominations, Islam is not similarly divided between Sunnis and Shias. Also, the map likely wildly overstates the religiosity of Scandinavians, since the data is based on state Church records and everyone is assigned to a church at birth. Actual church attendance is much lower than the map would suggest. Omman’s Hindu population comes from migrant workers who outnumber locals. The Buddhist area in Russia is Kalmykia. Two things to note about Europe. The formerly communist states of East Germany and Czechoslovakia (now Czech Republic and Slovakia) are clearly visible on the map as the areas with no religion. Second, despite right-wing fear-mongering, Muslims do not form a majority in any area of Western Europe. Interestingly, despite Latin American immigration to the United States, the vast majority of its census areas remain protestant majorities. Also, British Columbia is an interesting anomaly being largely non-religious. 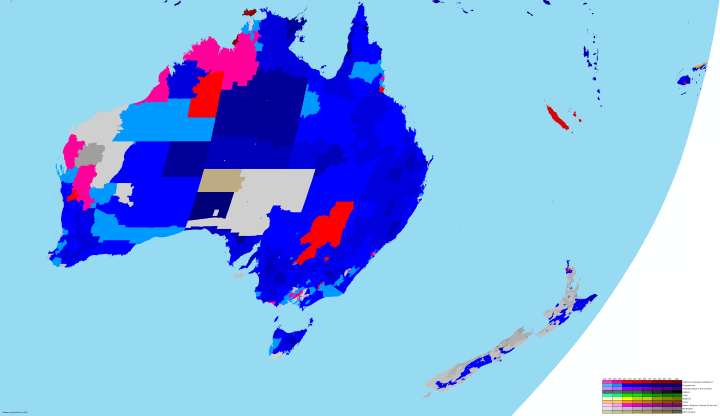 While most of Australia is still nominally religious, most of New Zealand is not. Perhaps the most interesting thing about Asia are the random Protestant census areas. These include parts of India, Sarawak in Malaysia and North Sulawesi and West Papua in Indonesia. No comments on Africa? On the survival of pre-colonial religions in Mozambique? On the interesting range of religions where Protestant and Catholic colonial religions mix with pre-colonial Islam and other indigenous religions in West Africa? 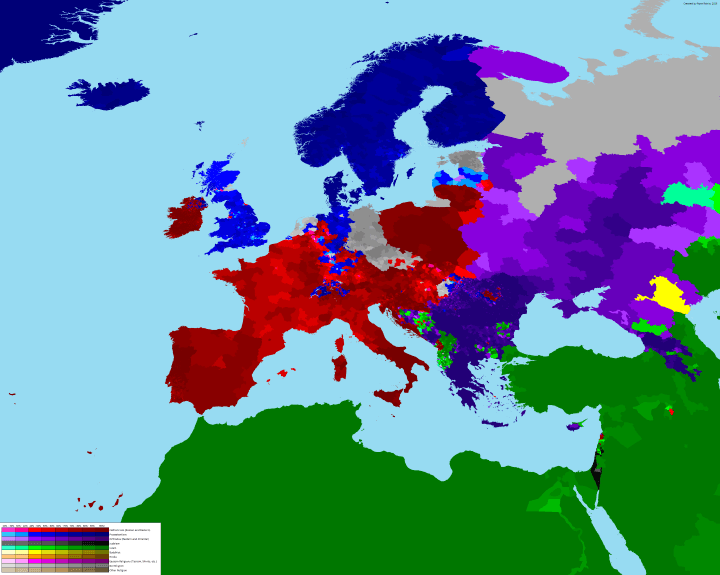 That “big” green part of Bosnia, surrounded with purple ain’t correct, it should be purple too, mostly orthodox there. No, Bosnia is a muslim Turk country with Catholic Croat and Orthodox Serb minorities. No, Bosnia has a majority muslim group called Bosnian and they’re not Turkish. They don’t even below to Turkic family. They’re Slavic but it’s true they affect from Turks. Notice that even though the U.S. is still predominantly Protestant, the big metro areas are catholic (Chicago, NY and most east coast, LA, San Francisco, Houston, Cleveland). Also little Protestan enclaves in south Brazil are probably the German colonies, but that big Protestant chunk in the Eastern coast of Central America is baffling. That zone has a lot of creole people who came from Jamaica and former British Caribbean Leeward Islands to work in sugar cane plantations, some of this communities remain speaking English as a mother tongue and maintain their Protestant churches. Actually, Gustavo, southern* Brazil does owe these protestant pockets to German immigration. 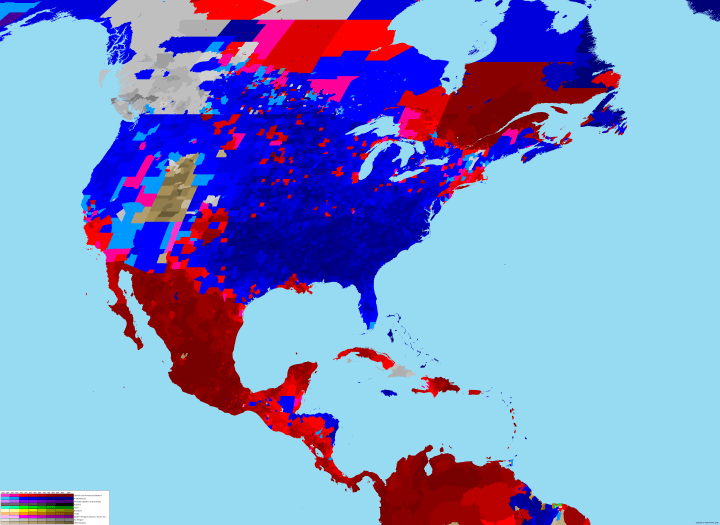 If you take a look at the 2010 census map (http://www.censo2010.ibge.gov.br/apps/mapa/), you can see that the largest Lutheran communities in RS match the blue areas on the state in the redditor’s map. You know, as a Brazilian like me, that Lutherans don’t mass convert the local population like the Pentecostals and such. The blue in Rio, Recife metro area, and other pockets around the country where there’s never been much external immigration; those, however, centainly are the Pentecostal converts you’re talking about, and those compromise most of the ~20%. Metropolitan areas are mostly Catholic because of Latin American immigration, and indeed the Protestant enclaves in southern Brazil are German colonies. So Greece is a Protestant country, in the opinion of the creator of the map? No, of course not. The entire dark blue area in the Balcans should be dark purple instead. S.Korea has tons of Christians. Not sure if there are more Protestants or Christians, but there are churches evertwhere. North Sulawesi – Christians, Middle Sulawesi – Tentena, strong Christian communiti, Middle-South Sulawesi – Rantepao – Torajan culture who adopt christianity. Dutch influence (missionars). In many parts of Molucas there are also christians. 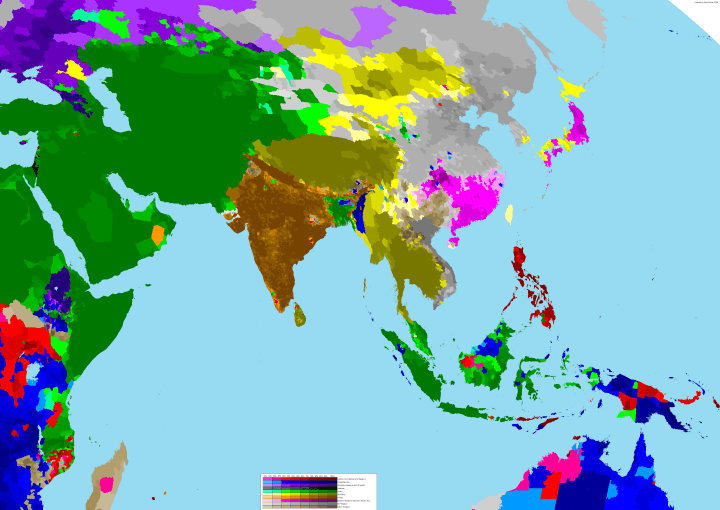 Dutch dominated in this area when spice (nutmeg, clove, peper) was important, but nowdays muslim majority populate these areas too and christians could disappear. The islamic world looks more uniform that it actually is. It would have been interesting if Islam had been broken down into Sunni, Shia, Alevite etc. just as christianity was broken down into a number of subgroups. And interestingly, the author appears to consider Mormons non-Christians (see Utah, colored in as ‘other religions’. full agreement on the islam front though. Most Christians (including myself) consider the LDS Church to be outside of mainstream Christianity as well. North Papua was originally colonized by Germany, South Papua by Britain. West Papua, while today part of Indonesia, was generally beyond the limits of Islamic expansion, and was visited by a number of trading powers over the centuries. I’m guessing East Papua’s divide is from German New Guinea and British New Guinea. I doubt the author has ever been near it. How is a spot a majority? Also, I’m so glad this site always takes the time to aim a kick at “right-wing fear-mongering” in Europe. Just wait until your daughter gets raped by Somalis, you b****rd. After writing that, the author completely discredits the accuracy of his map. Did he rig the stats to reflect his left-wing extremist views? So much delusion *sigh* When will people grow out of this god thing? I see Slovakia full red. Make sure, where Slovakia is. Autori napísali pravdu, NDR a ČSSR – ako zdroje “nevercov” – akurát že nešpecifikovali, že rozdelením Československa vznikla jedna takmer totálna ateistická republika a druhá, ktorej obyvatelia sa hlásia k viere. Ale to je detail. a čitateľ mapy ho prečíta správne. I’m proud of Czechia, really. BE SERIOUS! your data are wrong regarding Madagascar Island religions! Totally WRONG! Drawing FAKE maps from DUBIOUS DATA is insane! Your supposed “taoism etc…” zone simply DOES NOT EXIST AT ALL! Even if you take in account the 100,000 asian originators over there! We are 24 million inhabitants in Madagascar! Do some maths please or DO NOT OUTPUT STUPID MAPS! YOU.ARE.NOT.SERIOUS!!! CHECK YOUR SOURCES! Madagascar is 57% Christian, 25% Muslim. And people are Animist in parallel! JUST INVESTIGATE AND USE at least SOLID AND CREDIBLE DATA on the web! Why are you shouting at a blog editor? You should address the person who made the map. I guess we have to wait another decade for that blessing to be upon us. just one is one to many anyway. The part of Antarctica, which you have painted red, should have been white too. No part of Antarctica belongs to any country and there is no permanent population. Many countries have made territorial claims there in the past, many of them overlapping, but those countries have also signed the Antarctic treaty, which does not recognize the claims. Take a stroll down some of the white British minority cities. Have a wander through half of the boroughs of London. Just put the maps up and keep your leftard gibberish to yourself. Can we get a KML file so we Google Earth Pro users can add this as a layer?